When I first began woodworking in 2002, every bit of the experience I had with wood and wood tools would fit inside the collet of a small flush trim router. Prompted by watching Norm Abram’s New Yankee Workshop on PBS, I jumped into the woodworking ring when my wife mentioned buying a few book cases. I pay cash for everything now, but at the time, I loaded up the credit card for a table saw, a bandsaw, a router and a couple of sheets of oak plywood. What originally was going to cost $140 was already approaching the one grand mark. Make your dollars go further by buying smart! As a newbie, I only knew of one place to get wood – the big box store. I quickly learned that I was in for sticker shock. 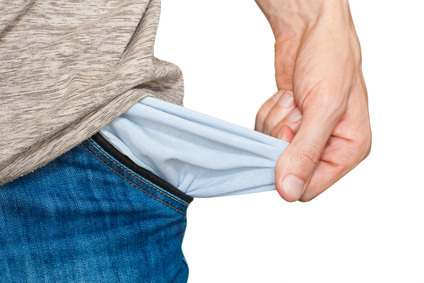 Paying retail for clear pine, red oak and poplar boards can financially wipe you out quick! As a result, my projects were carefully calculated to get the most out of every single board. Looking back, I wasted a lot money by paying a premium price when I didn’t have to. Over the past decade, I’ve found a number of alternative sources for obtaining materials at a much lower cost. Perhaps what I’ve learned will help you cut your lumber costs too! Big box stores don’t want to hang on to damaged goods, they want to get rid of them…quickly. As a result, discounts are available just for the asking. Fork lift drivers at my local home improvement store are notorious for ramming the tines of their machine into the edges of oak and birch plywood. Since I never use full, intact sheets, I can easily work around any damage. Simply asking the manager if he’s willing to knock the price down will almost always result in savings. [pullquote align=”right” cite=”” link=”” color=”#0404B4″ class=”” size=”22″]Tip: When the manager makes an offer, make a slightly lower counter-offer. Most of the time, you can get a even better deal. [/pullquote]When I need solid lumber, I begin by looking for imperfect boards to get real savings. For example, I can pay $12 for a good 1x8x6. But I might be able to get a slightly damaged 1x8x8 for only $10. If my project will consist of short pieces, slightly warped or twisted boards will still work for me, but the store has a hard time selling them at full price. As a result, you can get lumber that’s perfect for your application at a discount. If you want to learn where the absolute best deals and resources for lumber are, join your local woodworking club! Members are readily willing to share where you can find certain species of wood at good prices, or they just might have some available in their shop that they are willing to part with. Woodworkers are wood collectors by nature and many keep a plentiful supply of a variety of woods. Recently, a local woodworking club member I know just happened to have a piece of cherry wood in just the size I needed to finish a project. He had been hanging on to it for more than 10 years! He saved me a 180-mile drive to a hardwood specialty store and about $60 on the price of the wood. Cabinet makers are a good resource for quality lumber at reasonable prices. These shops buy their materials by the truckload directly from suppliers, at substantial savings. A couple of the cabinet shops in my area are willing to sell their stock (with a small profit to them) to woodworkers. Building a friendly relationship with them just might cut your project material costs to a fraction of retail price. 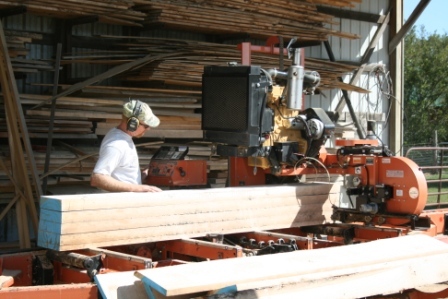 Getting you lumber from a sawmill is the most economical way to go. Comparing current prices, I’ve saved up to 80% off retail prices. There are a few minor drawbacks to consider with this approach, but none that can’t be worked around. Photo courtesy of Trillium Dell Timberworks. It’s not too difficult to find someone nearby that has a small sawmill business. Portable bandsaw milling machines like Wood-Mizer have become quite popular as part-time businesses. Usually, the owners keep an inventory on hand just for woodworkers. Plus, they carry a good mixture of local species that may not be readily available elsewhere. You can also hire them to cut custom boards from logs you supply. Remember my woodworking club friend with the cherry wood (above)? He was given logs from two trees that the city had cut down and were going to grind into chips. He hauled them to a small sawmill and got them cut for a mere 12 cents/bf! Keep in mind that when sawmills cut logs into lumber, the wood will be too wet for you to use right away. Unless you take it to a kiln dryer, you’ll need to store it in a dry place for several months or years to allow the wood to dry to an acceptable moisture content for woodworking. Secondly, buying rough lumber from a sawmill leaves an uneven surface and saw blade marks that must be removed. You’ll need to invest in a good planer, something most woodworkers wouldn’t mind having anyway. Finally, you can save a bundle just by keeping your eyes and ears open. Even when you don’t have a specific project in mind at the time, don’t turn away a good deal when it comes available. Some day, you’ll be glad you made the wise investment. Be the first to comment on "Replenishing your wood supply on a budget"